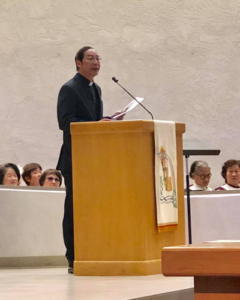 On December 30, Irvine Taiwanese Presbyterian Church of Laguna Woods, a “new” church development in Los Ranchos, celebrated its twenty-fifth anniversary. The celebration happened in a joint worship service with Geneva Presbyterian Church, where they now worship. Six of us with Presbytery connections joined them: Tom Cramer and Robin Clardy (both of whom brought greetings); Deborah Mayhew; Darryl Clardy and Henry Mayhew; and me. I loved hearing ITPC’s story. The church plant spent its first nine years at Creekside Christian Fellowship in Irvine, growing from thirty to forty people. In 2003, when Creekside could no longer provide space, ITPC moved to Tustin Presbyterian Church. It was an understandable response to a circumstance beyond their control. Their move to Geneva was more strategic. By 2012, the fellowship had grown to a hundred members. Two-thirds of those had retired and moved to Laguna Woods Village. Relocating made sense. The step did not come easily. Those who still lived around Tustin chose to stay and form a new fellowship rather than drive to Laguna Woods. The hundred-member single fellowship became two, a southern group with seventy and a northern group with thirty. 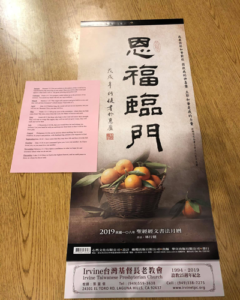 The two congregations would be known as “Irvine Taiwanese South” and “Irvine Taiwanese North,” even though both had left Irvine behind several years earlier. The move, though difficult, seems to have been wise. As of December 30, the southern fellowship now has 113 members, a sixty percent gain since they divided in 2012. Their programs include Sunday School, Bible studies, partnerships with sister congregations in Taiwan, sponsorships of missionaries, and—most strikingly—outreach classes to Laguna Woods Village that include instruction in computers, psychology, and Japanese. As I think about ITPC’s story, a few observations come to mind. First, they know themselves. They are a community of retired, professional, Taiwanese-speaking Christians living in or near Laguna Woods. They are a niche group within a larger community and they are okay being so. Second, they know their call. 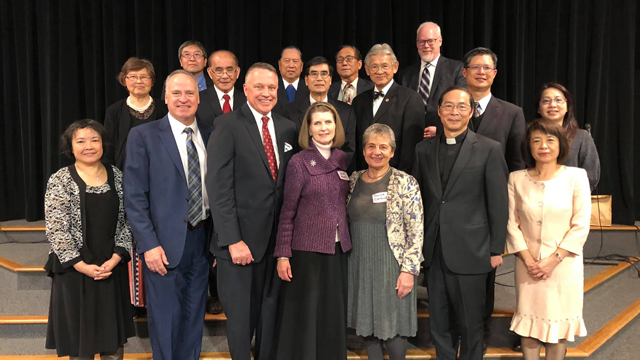 They are seeking to reach friends and neighbors with the Gospel of Christ—friends and neighbors who also are retired, professional, and Taiwanese-speaking. Third, they have connected well with their mission field. Their outreach classes routinely draw as many people as attend Sunday worship. Their engagement at Laguna Woods Village has drawn into the community people with no prior Christian experience. They minister effectively to a group that would be hard for other churches to reach. Fourth, they are flourishing in spite of their aging membership. Or—perhaps better—because of it. They have tapped a critical demographic in Southern California. The fastest-growing population in our presbytery’s region is people over 65. While all other age groups project a rise of 0.1% or less over the next ten years, seniors are expected to grow by 4.5%. ITPC’s leaders recognize that retirees in Southern California make for a promising mission field. Finally, they have no building. Unlike the other attributes—all positive—this is neither good nor bad. In 2003, it led to insecurity when Creekside ended their lease. In 2012, it gave them freedom to move. They may not know the security of a permanent residence (just as those described in Hebrews 13:14), but they can move again as God leads. It was a good day. I saw believers who understood their identity as citizens of heaven and residents of Southern California. I heard how God drew them to a new place to continue the work to which they were already called, and how they sought the good of the people there (see Jeremiah 29:7). I saw leaders who pursued the work not because it would bring numerical growth, but because they knew clearly the charge of the Gospel. And I heard that their faithfulness has led to numerical growth anyway. In other words, ITPC’s effectiveness encouraged me. I look forward to the hope of their becoming a chartered congregation before the end of the year.